The huge and unexpected success of 2010's Despicable Me changed the dynamic of animation in Hollywood. Someone besides Disney or even DreamWorks had now crashed the party and created a mega hit complete with all of the necessary elements for major marketability, and it had crossover appeal to adults. As with any animated franchise, the more it became sequelized and over milked, the less adult friendly it became (the Minions movie was a bit of a chore to sit through), but it has remained a blockbuster game changer and it put Illumination on the map, taking DreamWorks' place as the number two animation studio at the box office. Despicable Me 3 begins with Gru (Steve Carrell) and his new wife Lucy (Kristen Wiig), agents for the Anti-Villain League (AVL) facing off against a super villain named Balthazar Bratt (Trey Parker of South Park fame.). Bratt is a former child star whose hit sitcom, Evil Bratt, was cancelled after he had a sudden growth spurt and went from cute to awkward, and he has refused to move on to the point where he is stuck in the '80's and has become a real life villain, modeling his career after his TV alter ego. When Gru and Lucy fail to stop Bratt from stealing the world's most valuable diamond, they are abruptly dismissed by Valerie Da Vinci (Jenny Slate), the new head of the AVL. Gru and Lucy break the news to the children, Margo, Edith and Agnes, but insist that everything is fine and they will find new jobs soon. The kids take the news better than the Minions do, and they collectively decide to quit when Gru refuses to return to a life of villainy, going off to try it on their own. 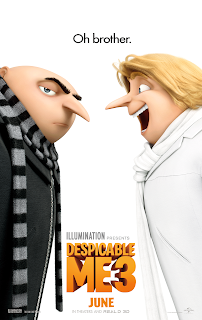 Meanwhile, Gru is met by a huge surprise when he finds out that he has a long lost twin brother named Dru (also voiced by Steve Carrell). The two quickly make a connection, and Dru drops another bombshell on Gru: he wants his brother to teach him how be a super villain. This is definitely the kind of movie that you have to go into with reasonable expectations, and it's going to play better with kids than with adults. But it's fast moving and entertaining, with some amusing moments (the Minions are annoying as always, but they also have their share of oddly amusing moments, as always.). Carrell does very well playing opposite himself, and it's fun watching the relationship between Lucy and the girls grow. The Bratt character plays better in the film than he does in the trailers, though Parker's performance is capable but nothing special, and he's certainly not up there with Jason Segel and Benjamin Bratt as the previous villains in the series. The wonderful sense of heart that the first movie had is nearly impossible to recapture, because Gru could only become a good guy after inheriting children once. That was such a crucial part of what the original truly great that the sequels just can't compete, and they are far more reliant on hit and miss slapstick. This is definitely a case where the original is a classic and the sequels are merely fun, but Despicable Me 3 is still fun, especially if you see it with your kids. I took my 10-year old niece, and the series has been a tradition with us. We had a great time watching it together, and ever kids in the audience was excited to be there (more than one carrying a stuffed unicorn) and there is very definitely a place for such films. It's not PIXAR, or even top quality DreamWorks like How To Train Your Dragon 2, but it does what it does well enough. It would be nice if it was closer in quality to the original, but even PIXAR has a hard time with that, and if you're looking at sequels that decline in quality, I'll take Despicable Me 3 over Pirates of The Caribbean: Dean Men Tell No Tales any day. My seven year old daughter and I went to see this movie in the theater together. It is our favorite of the three so far! Hilarious dialogue, awesome 80's music, and over the top action scenes. My daughter has the loudest, heartiest chortle and this movie had her laughing continuously. I enjoyed your blog post.